Tangier is a popular and interesting Moroccan city that offers visitors a truly unique experience. The city has a fascinating culture that mixes elements of north Africa, Spain, Portugal, and France. It's located in the northern part of the country and is easy to visit from Spain. There are frequent ferries that travel across the Strait of Gibraltar, which separates Morocco from Spain. There is no shortage of budget accommodation options in Tangier. The quality of facilities can vary so read reviews before making reservations. Prices are usually reasonable and many hostels and hotels are located in traditional buildings, which can make for a unique and fun experience. 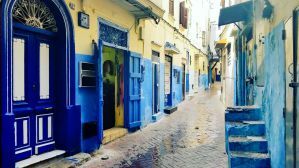 How much do hostels in Tangier cost? A good hostel for solo travellers, couples, groups of friends, and families. Dar Jameel, or the House of Grace and Beauty, combines traditional Moroccan accommodation with modern comforts and amenities. The hostel makes a nice retreat in Tangier and it makes a peaceful place to escape some of the city's chaos. It's located within the lively medina and is just ten minutes from the international port and the center of town. This hostel makes a good base for exploring the city. Dar Jameel has four ensuite rooms as well as four standard rooms which share bathrooms. The prices are reasonable and there's a nice rooftop terrace that looks out over the city. In total, the hostel can hold 20 people so it has a very personal vibe where it's easy to get to know other guests as well as the staff. Whether you're traveling with family, friends, alone, or as a couple, this hostel has something that will meet your needs and budget. The staff here are also wonderful. They will go out of their way to make sure your stay is fun and comfortable. There's a delicious breakfast that is served every morning and the rooms are well maintained. Don't hesitate to ask if you have any questions. A great hostel for backpackers, solo travellers, and groups of friends. Al-Andalusi Hostel is another great option for travelers to Tangier. It's conveniently located right in the heart of the medina and is next to the Grand Socco. This hostel makes a great place to base yourself during your time in the city. They offer all kinds of amenities for guests including a free breakfast every morning, wi-fi throughout, and a nice rooftop terrace that has a great view of the city. The hostel also has a communal kitchen that guests can use, a public computer, a book exchange, and several guitars available for use. There's a mellow vibe where you can just hang out and get to know other guests. Whether you're traveling alone or with friends, you will quickly feel right at home here. The hostel staff is great and helpful. Many staff members are international travelers themselves and the can give you a great perspective on things to see and do in the city. They can also help you organize any number of activities in Morocco including surfing, trekking, and camel rides. 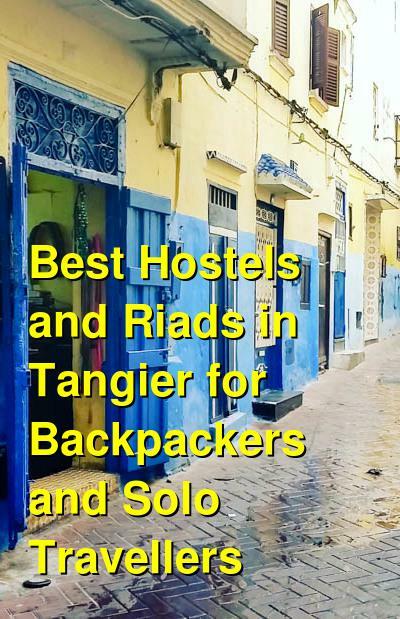 Tangier Melting Pot Hostel is a popular hostel in Tangier's medina. It's located in a traditional Moroccan house that has all kinds of amenities available for guests. There's a large kitchen which guests can use, several computers, and free wi-fi throughout the hostel. There's also a small bar area and two terraces that offer nice views. This is a great hostel where you can relax and meet other travelers, curl up with a book, or simply rest after a busy day of exploration and travel. A free breakfast is also served every morning. The hostel has a variety of room options available including four, six, and eight bed dorms. There are also doubles available. Each room has comfortable beds and dorm beds come with security lockers. The rooms are kept clean and the staff are great. They'll go out of their way to help you with any activities or questions you might have. A good option for backpackers, solo travellers, and groups of friends. Dar Bargach is another favorite place to stay for budget travelers to Tangier. It's located in a traditional house that has been fully renovated. The hostel is small with just six different rooms that sleep anywhere from three to ten people. Every room has its own bathroom and shower attached and the rooms look out over the patio. There's a nice lounge area where you can eat breakfast or meet other guests and every Friday night the staff hosts a traditional couscous dinner for guests. This is a fun event and a good time to meet other travelers. The hostel has a wonderful staff who can help you arrange any number of activities around town. They can also coordinate airport pickup for a small fee. If you're looking for a relaxed and comfortable place to stay that is convenient to everything, then this is a good option.